The employer knew, or with the exercise of reasonable diligence could have known, of the violation of the safety regulation. 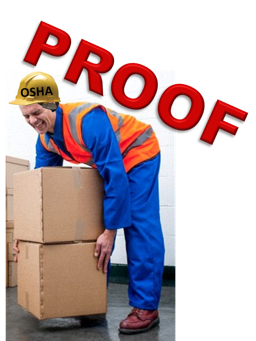 It is critical that employers focus on each element of OSHA’s burden of proof. For example, in element 3, mere speculation that an employee could be exposed to a hazard is not sufficient. In Secretary of Labor v. Garden Ridge, (OSHRC) Docket No. 10-1082, the employer was cited for violation of OSHA General Industry Machine Guarding Standard under Section 1910.212(a)(1). The facts reveal the employee stood outside of a trash compactor hatch door and pushed down the chute with a 10ft long piece of 2 x 4 lumber. The hatch door was approximately 10ft from the compactor chamber and hydraulic ram. OSHA argued that an employee was in the “zone of danger” of the hydraulic ram during the time that the trash was pushed down the chute. To support its case, a compliance officer testified to a “hypothetical scenario” in which an employee would step-up on the compactor chute to push the trash down and if the employee slipped, the employee would have been exposed to the hazard of the hydraulic ram. An administrative law judge vacated the citation on the grounds that the compliance officer’s scenario of an exposure was merely speculative and did not represent an actual hazard experienced by an employee who operated the compactor. Many times, employers learn of safety hazards through supervisory employees. OSHA has taken the position that the knowledge of the supervisor is imputed directly to the employer. So if the supervisor knew or should have known of the safety regulation violation, his knowledge is imputed to the employer and OSHA can use this fact to show the employer had knowledge of the violation. So what happens when it is the supervisor who independently breaks a safety rule? In Comtran Group, Inc. v. U.S. Dept. of Labor, 722 F.3d 1304 (11th Cir. 2013), the court found an exception to the general rule. The Comtran court held that when a supervisor is acting independently and knows that he has violated an OSHA regulation, his knowledge is not necessarily imputed to the employer. The court found in such instances that OSHA must prove something more than merely pointing to the supervisor’s misconduct itself. OSHA must establish evidence independent of the supervisor’s misconduct. For example, insufficient safety standards or insufficient safety training establish the employer had reason to foresee the unsafe conduct of the supervisor. Therefore, employers should always take steps to ensure that safety programs are applied effectively to supervisors and other employees and document all safety training. The foregoing cases illustrate that employers must not accept citations at face value as being factually or legally correct. Employers should carefully analyze and contest citations where there is no reasonable proof of employee exposure or employer knowledge.